Kingston University students are causing filthy streets and overflowing bins in the town centre following nights out, according to the boss of a town centre supermarket. 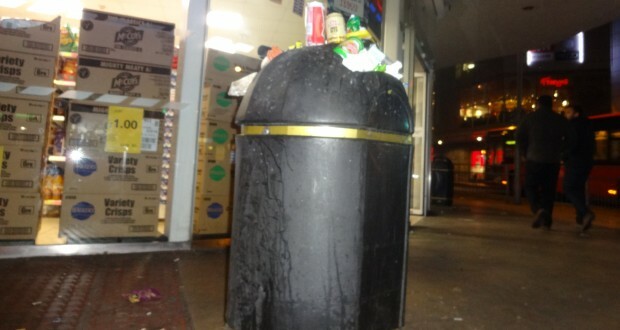 Tesco Express has complained that the bins outside the store on Cromwell Road in Kingston often overflow, generally on a Friday and Saturday night, blaming drunken KU students for turning the area into an eyesore. Tesco Express store manager, Sajeev Velmuthu, said: “People are kicking the bins and knocking them over which is cluttering the area outside the shop. Velmuthu also said that most nights they leave the bins inside, breaking health and safety regulations, as they are too big for the small space inside the shop. The bins outside Tesco get cleaned at 6am in the morning. The store manager said that it was not their employees that make the mess and that it was the people overnight who are responsible. Velmuthu suggested that to solve the problem the local pubs have to take responsibility in order to curb binge drinking in the Kingston area. Kingston University student and Quebec House resident, Mohammad Saeed, has also complained about the level of mess outside the Tesco store. The KU student said the area gets obstructed and busy from Tesco workers pulling up on the pavement with their delivery lorries and for bin collection. He added that Tesco should choose another place for the trucks, as it is a really busy street with the cars and the people. The Tesco Store Manager said he would speak to the operations manager about possibly changing the collection time of the bins.